OK, now that Christmas is winding down for me, (only one more home to go!!!!) I have made an observation about brides. I have met with 6 in the past week, and something is terribly amiss. Let me begin with this statement: If you are a bride, please know that I love you. If I didn’t, I would not be giving up soooo many weekends every year to spend with you. I would be with my family, taking a nap or a walk or cleaning out my basement or washing my hair. But no, I am with you. I choose you. I am asking you for a favor. Its a personal favor for me, but it benefits you. Trust your wedding professionals. Most of all, trust me as your florist. Someone has convinced you that you must know everything about flowers. Someone has told you it is necessary to spend hours on the internet, cutting and pasting and printing…oh my! Here’s the deal: They lied!!! Don’t get me wrong; I love when you come with all your pictures and things you have found, but it is sooo much unnecessary pressure! One of my brides confessed she spent 8 hours looking at flowers on the internet and then printed out all her pictures for me. EIGHT HOURS!!!! Kudos to her and the many others like her, but there is an easier way. Save yourself the trouble and printing cost. I have great portfolios, books and magazines. If you want to spend all that time looking on the net, then by all means, go for it, but it is not necessary. I appreciate that you want to educate yourself, but don’t stress out in the process. You are in the hands of a seasoned professional. You can trust me. I am not selling used cars. I am designing a wedding for you, that reflects YOUR tastes and budget. So take a deep breath, relax, and be your fabulous self. Leave the flowers to me. Its what I do, and have done for 22 years. Its OK not to know. I won’t think you are stupid. You were smart enought to choose me, remember? If you take recipies to your caterer and baker, and print out googled medical treatments to your doctor, or a complete playlist to your dj or band, you might need to seek professional help of the non-wedding variety. But I digress. I love you, brides. I am trying to help you. So breathe, and just be. You are the bride. I am the florist. I love that you want to be hands-on. And I am glad to hold your hand. But when I meet you for the first time, and your hands are already shaking, I am sad. Trust is a good thing. And I am a good florist. You can be a good bride. They don’t make TV shows about good brides, but that’s OK. Most important: I want you to be a good wife. A peaceful human being. I don’t want repeat customers when it comes to weddings. Let’s begin the journey in a sane fashion, shall we? I knew you would agree! Consider this letter a hug from a trusted friend. Right now I am your wedding florist. On the other side of the aisle, I am your friend. Trust me, you’ll see. 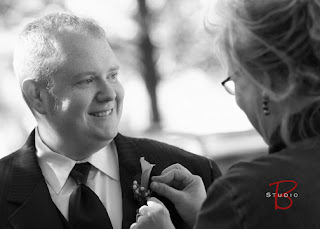 The picture is of me pinning a boutonniere. Thanks to Daniel Knight of Studio B for the pics. He always give me great pictures, and makes me look so good! It was the items that I “let go” and let the professionals handle that turned out to be my favorites! You are the BEST! And, the flowers you designed for my wedding were AMAZING! I knew you would do great … and let you go for it … and was WOW-ed! They were better than anything on the internet (or in Martha Stewart Weddings!) that I could have spent hours and hours searching for. Thank you for your creativity! The flowers were SPECTACULAR and I loved your creativity of using my collection of antique broaches and buttons and clip earings in all of the bouquets and boutineers. Future brides, take her advice! The more freedom you give Jodi, the more fabulous your wedding will be! I would love 100 brides just like you. You were a dream and a pleasure to work with.